I was late to the party but somehow managed to catch up quickly. While Hobby Lobby has now expanded to California, I’d never stepped foot into one of the more than 800 stores until moving to Colorado. How I lived for the greater part of my life without Hobby Lobby remains a mystery. Remarkably, somehow I survived. 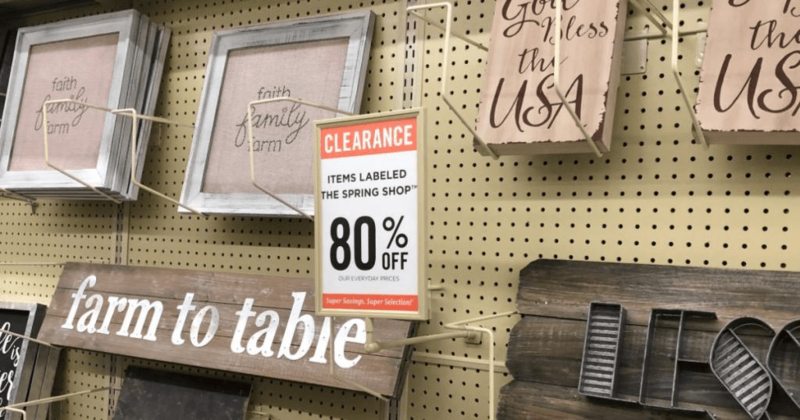 Hobby Lobby is basically an arts-and-crafts heaven but also includes hobbies, picture frames and framing; jewelry making, fabrics, floral and wedding supplies, cards and party ware, baskets, wearable art, home accents and holiday merchandise. And let me tell you, this company runs a tight ship. Generally, the prices at Hobby Lobby are good. 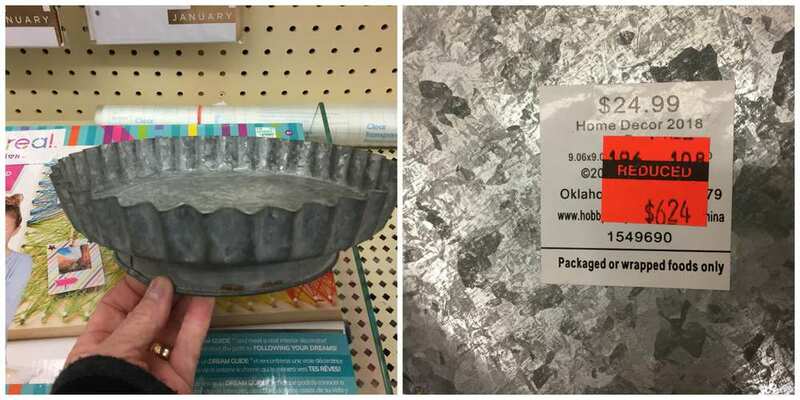 But if you know the secrets—these hacks, tips, and tricks—you’ll never pay the full price on anything at Hobby Lobby again. And you’ll routinely be saving 50% (sometimes up to 90%). Just about everything in the store goes on sale for 50% off at some time or another. Knowing how to anticipate those sales is the secret for saving big. The foregoing items are always on sale for 30% off the marked price. Tip: Buy greeting cards, gift wrap and bags, and party supplies at the dollar store, never at Hobby Lobby. Frames and shadow boxes, etc. Tip: Ribbon and floral always alternate weeks. So if ribbon is on sale this week, floral will be on sale next week. Also, if framed and canvas art is on sale this week, next week it will be wood and metal home accents. Start watching and you’ll see how the sales cycle works then plan accordingly. You can see this on your smartphone if you use the Hobby Lobby app, check the print flyer in-store or get it your mailbox, if you sign up to get that. You should! You’ll be the smartest Hobby Lobby customer in town because in no time you’ll be an expert on the sales cycles. I suppose it could be categorized as gift wrap, and if so, it’s my one exception to the tip above. 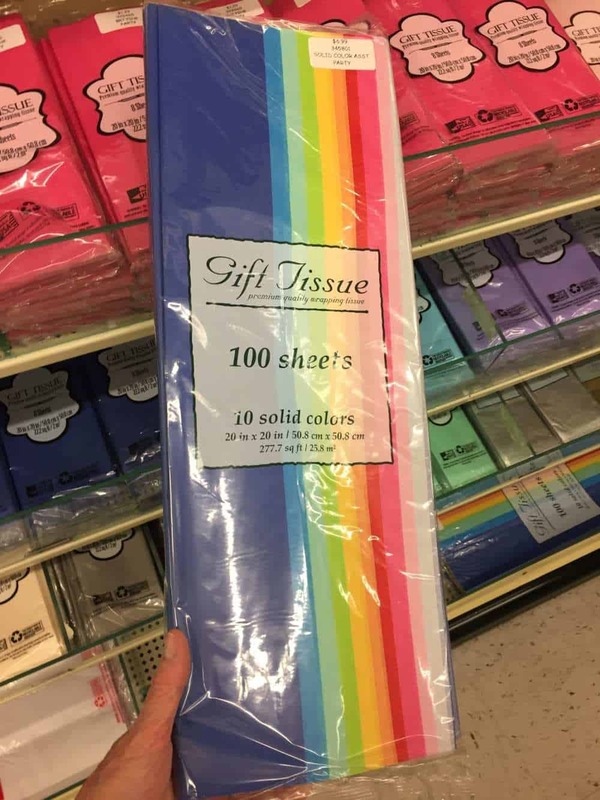 Buy tissue paper at Hobby Lobby. The in-store selections (online, not so much) together with the prices are fabulous—yes, that great. Use a 40% coupon to make it even greater. If you can’t wait for a 50% off sale, use a 40% off coupon. Every week Hobby Lobby issues a new 40% off coupon. 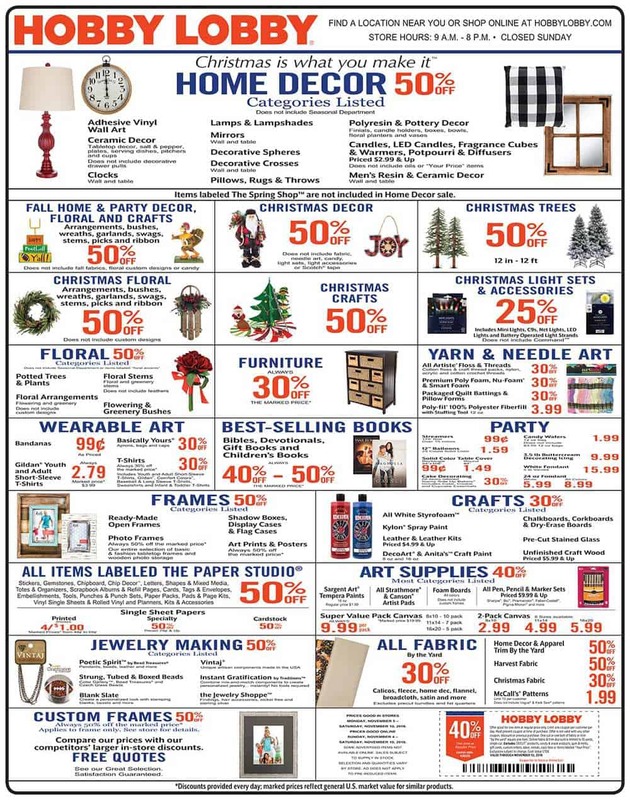 You can get this in the store’s weekly ad flyer or on your smartphone with the Hobby Lobby app. Open the current week’s coupon on your phone and then show it to the cashier at checkout. 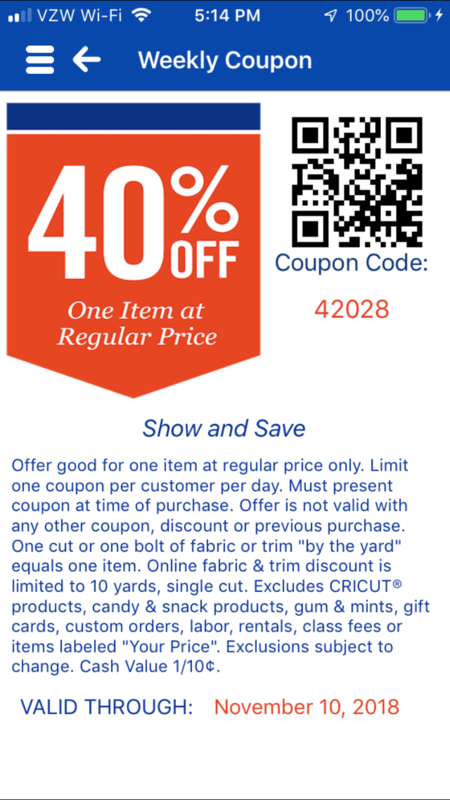 The weekly coupon is good for 40% off one regular-priced eligible item. Limit one coupon per person per day. I find that I can use the same coupon once every day until it expires at the end of the week. You can use your coupon to shop online. 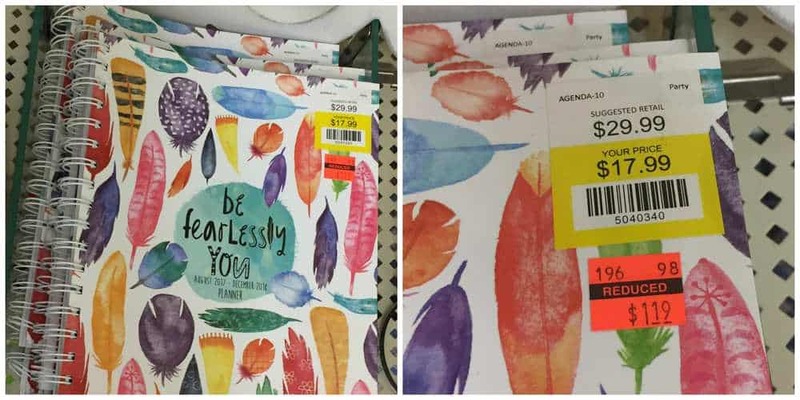 Hobby Lobby stores and website operate from the same warehouse so the prices always match. However, the selection online is not as great as in-store, and you’ll pay for shipping unless you wait for a free-shipping-with-minimum-purchase promo, which happens about four times a month. 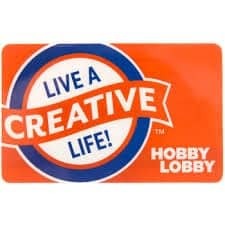 Buy a Hobby Lobby gift card at Raise.com at a discount of 10-12% (it varies considerably). Then use it to pay for your online order. It all adds up! 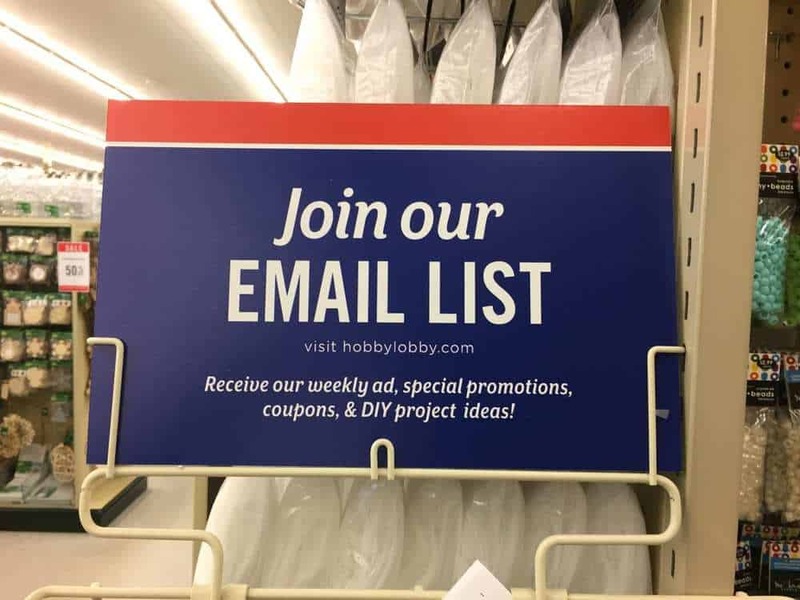 When shopping Hobby Lobby online, make sure you have your Ebates account activated ((how to: Here) at checkout and you’ll get 2% cash back on your Hobby Lobby online order. Ebates—plus free shipping, plus a discounted gift card—can make shopping at Hobby Lobby online a good deal. Two times each year—typically in late January and then again in early summer—it’s like Hobby Lobby discontinues the home accents department! 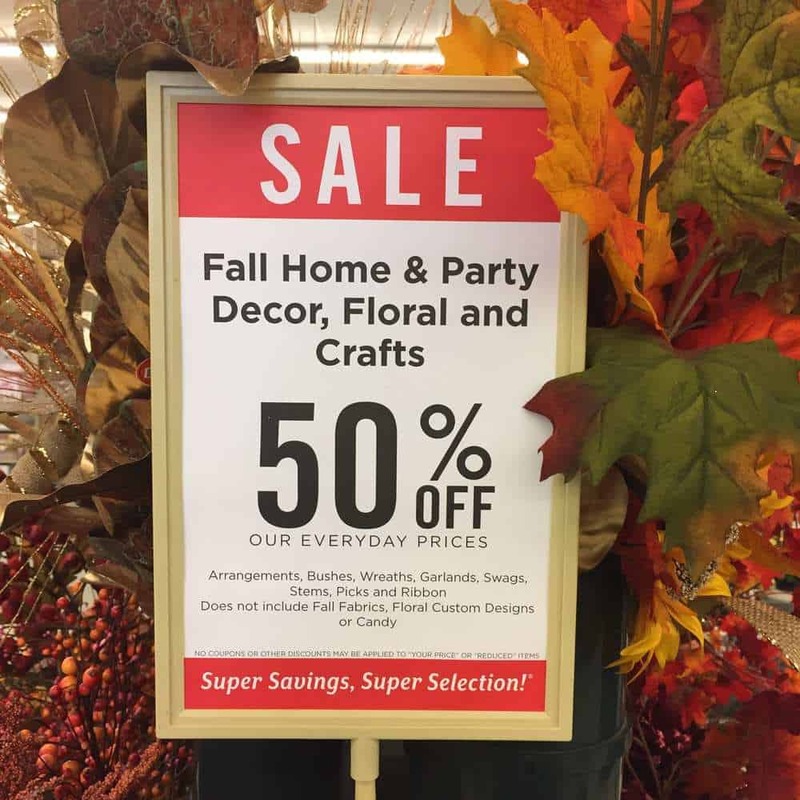 Everything starts at 50% off then quickly goes to 60%, on to 90% off until it’s all gone to make room for all the new home decor items. Here’s the strategy: You cannot combine a 40% Hobby Lobby coupon with a sale item, but you can use it instead of accepting the sale price. Just tell the cashier that you want it rung up at full price. Then apply the 40% off coupon. Disclaimer: My store does not allow this strategy, but others have reported that works for them because they shop in a store that allows it. Can’t hurt to ask. Take Christmas decor. It starts at 40% off in the summer, then heads down and hits clearance at 90% off after the holiday. 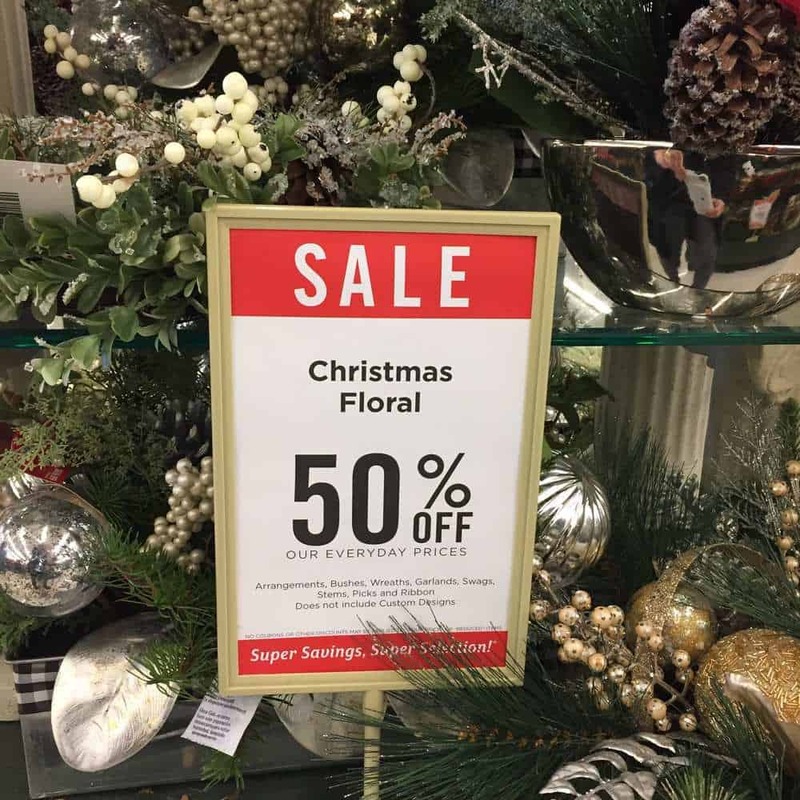 Tip: This week, nearly everything Christmas—not only floral—is 50% off! Every Hobby Lobby has one and it’s not at the front of the store. You have to search for it. At my store its in the farthest back corner. It takes up part of an aisle and the wall behind. Stuff cycles in and out of the Clearance area really fast because they’re continuously marked down until they reach 90% off. You won’t believe the bargains. Just remember even at 90% it’s a bad deal if it’s something you don’t need, won’t use and will just add clutter to your life. This is totally unpredictable and varies from one Hobby Lobby store to the next. But now and then you will find clearance sales on things throughout the store. Check the whole store for these hot spots with 60% off or more! 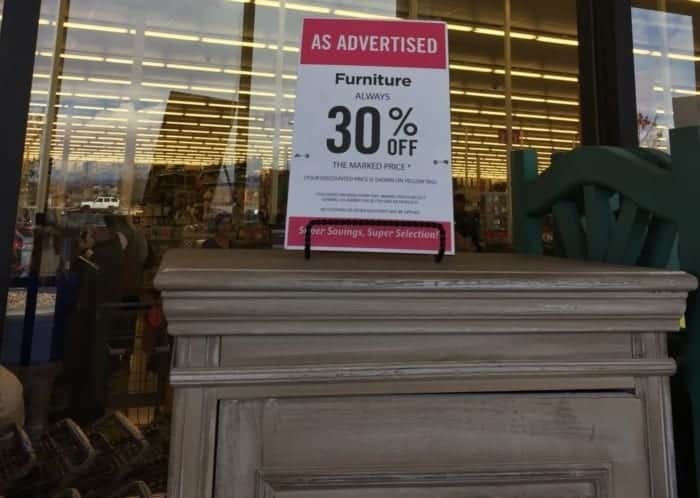 But only buy if it’s something you would have wanted at full price or even 30% off. Hobby Lobby does not accept competitors’ coupons, so don’t even try. However, they will give you the competing price on the exact same item. Bring the competition’s flyer with you, and if it’s a match, you will get that price. Tip: There are exclusions. 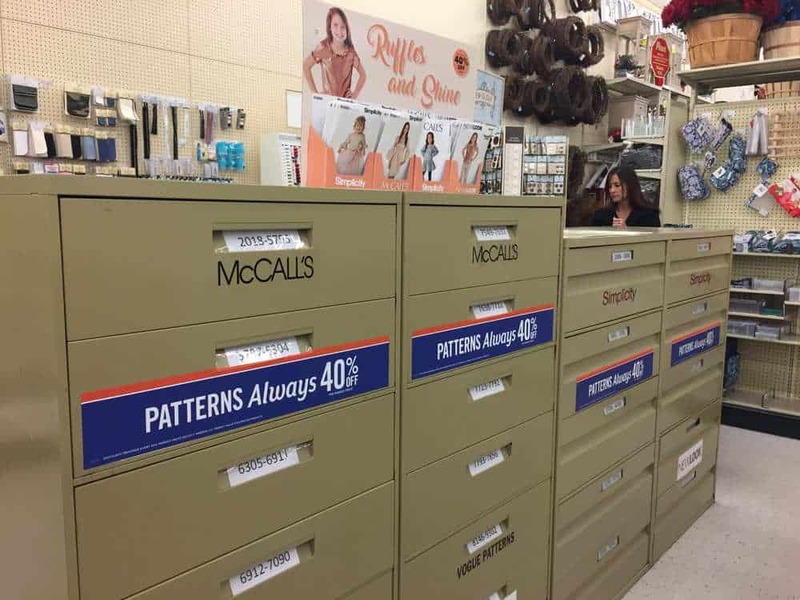 You cannot get the price match on doorbuster prices, Simplicity and McCall’s patterns, Cricut, Silhouette, Siozzic, Cuttlebug, clearance and closeout items. If you are shopping for one of these, bring a credit card or check from the organization for payment. Note: Your check must be signed in-store, once a manager has approved the transaction. If your organization qualifies, do not hesitate to get this discount! If an item you planned to purchase has a significant blemish or is damaged—if it doesn’t bother you or you can easily fix it—ask the cashier for a discount. Like this cute gingerbread kid. 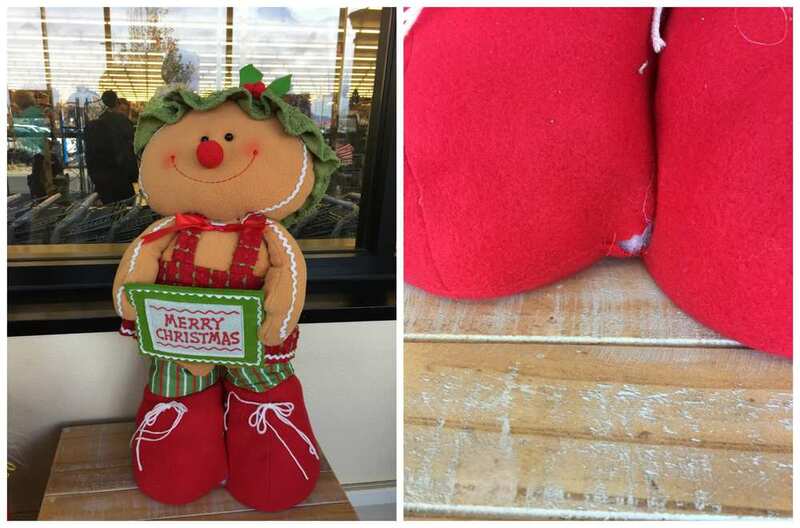 His foot is torn open revealing the stuffing. I inquired and was offered an additional 10% off, knowing I could sew up that seam in a few minutes if that would have been something I couldn’t live without. You can’t wait for a sale. You buy that thing at full price or the 30% off usual sale price. Then the next week you see it’s at 50% off. Don’t you hate when that happens? Well not to worry. Bring the item and your receipt back to the store within 14 days and they will adjust the price and give you back the difference. 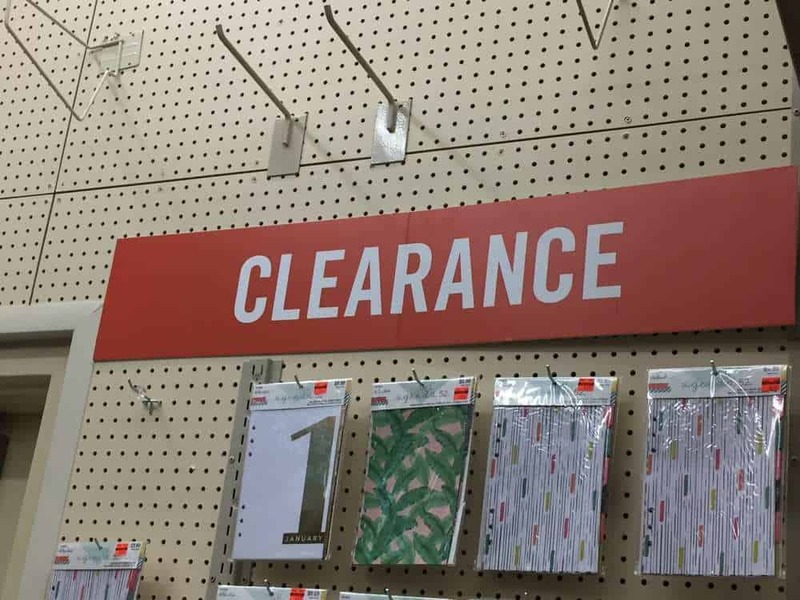 This does not apply to clearance items, however. If the item you want is on sale, but out of stock, ask Customer Service for a rain check. Once it’s back in stock, bring your rain check with you and you’ll get that sale price. Now you can use your 40% off coupon for something else. Hobby Lobby stores are typically the least crowded on Tuesday and Wednesday mornings, as soon after opening. You may think you’re the only customer there, and that’s OK. You can take your time to look around for clearance hot spots. 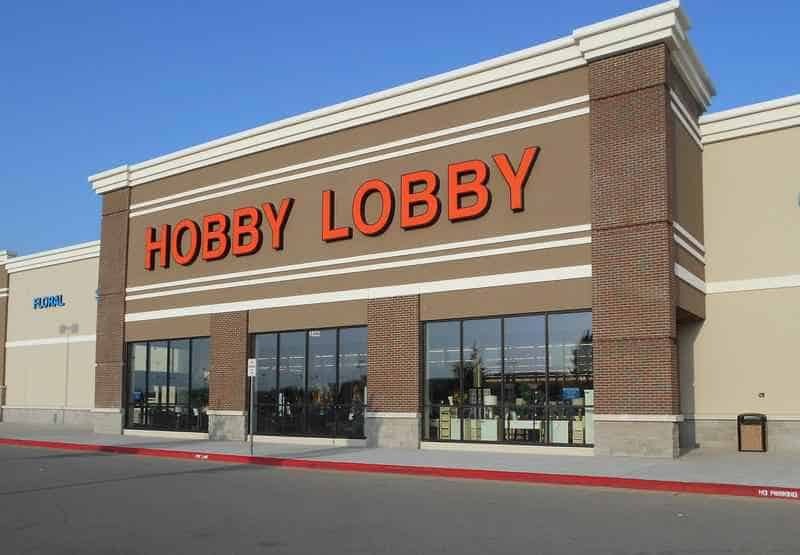 Hobby Lobby employees get an additional 15% off—on top of sale prices. If you need a job and have super self-control, you just might want to inquire! Question: What is your favorite way to save at Hobby Lobby?